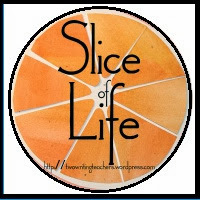 The slice of life there! It’s true. I fell asleep! Exhausted from such a busy week. Nat woke me up clapping that she’d set the trap to catch the Leprechaun-thank goodness she did it I would have missed out on submitting my daily slice by 11:59pm. What a busy day, week, month. We are over the half mark! and off she goes catching the leprechaun-adorable tale of Nat!